Better late than never! Having left it to the last minute to book my Chelsea Flower Show Tickets this year, I was relieved to find there were a few still available, all be it, at great expense. But this is the greatest flower show on earth after all! Luckily, unlike earlier in the week, the weather was just perfect as I started to make my way around the Main Avenue Gardens. My personal favourite, particularly for its planting, was Chris Beardshaw’s Healthy Cities Garden for Morgan Stanley. 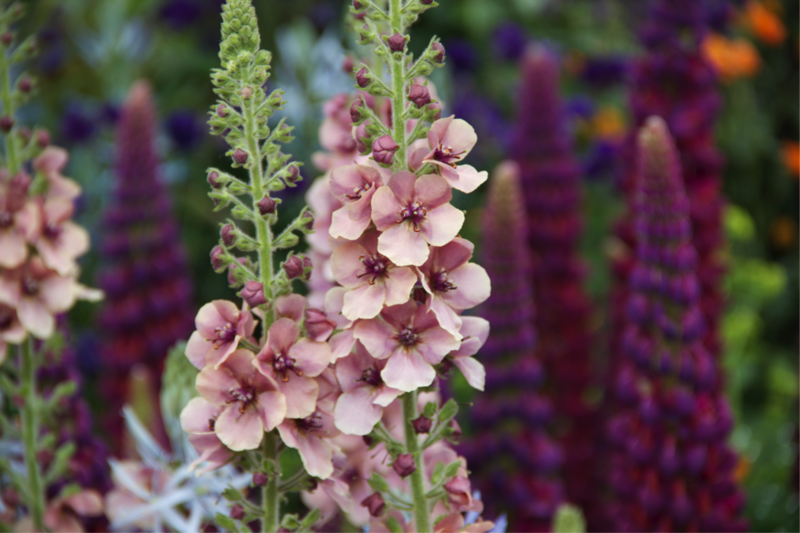 The combination of Lupin Masterpiece’ and Verbascum ‘Merlin’ was fabulous, and the ‘bruised’ colour scheme were beautifully executed. Sadly, I don’t tend to use Lupins in either my own or client’s gardens as the slugs love them. Its always good to know what will happen to the gardens after the show. This particular garden will be transferred to a community project in the East End of London. I’m not one for religiously following fashions, but I must admit to being quietly smug to find that I am apparently bang on trend with my use of the zingy orange flowers of Geum “Prinses Juliana’, which seemed to be ‘the’ plant of 2015. Another favourite was the fabulous thistle-like flowers of Circium rivulare ‘Atropurpureum’ which I have been trialling in my own garden. So far, it seems to be loving my clay soil, and the bees adore it. It will definitely be popping up in a few planting plans in the future. 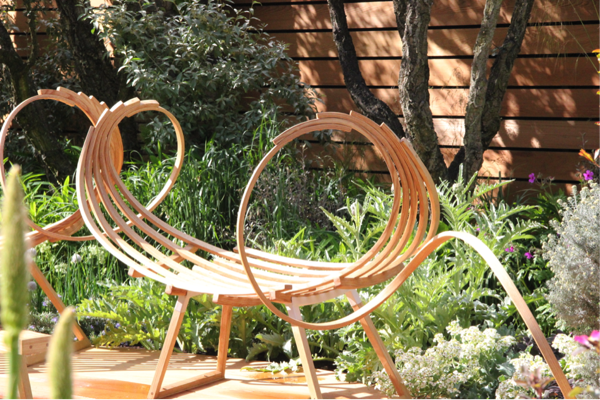 Best accessories must go to the stunning curvaceous bench in The Royal Bank of Scotland Garden, designed by Matthew Wilson.